Think you’re a real coffee connoisseur? Click here to play! Test out your java knowledge as you attempt to brew the perfect cup with beans from all over the world. If you’re as good as you think you are, you’ll definitely be handsomely rewarded. Start off by getting yourself to the CashOcinno coffee bar. It’s easily identified by the brown cup icon. Spin three or more of these simple signs to receive the top payout of the game, which is worth an amazing 10,000 times your line bet. Once you’re in the shop, start your brewing. Try out your Café Latte skills, as three of these symbols will get you up to 5,000 times your line bet. Next up is the classic Mocha Swiss. Three or more will payout up to 3,000 times your line bet. 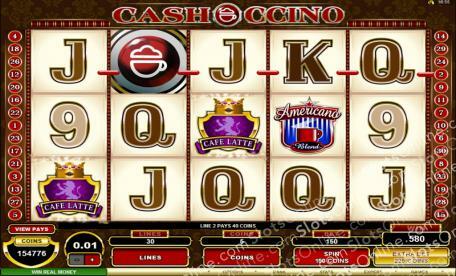 Espresso, Americana, and Bella Roma are also adorning the reels, each one waiting to pay out a very generous amount if you can line up three or more across an active payline. There are a couple of tricks to try out while you’re making your perfect cup in this coffee house. First is the golden scatter coffee coin. This symbol will trigger a number of free spins if you can spin three or more anywhere on the board. Though to really spice things up, try spinning the reels with the extra bet feature and you will activate high payouts as well as a 3x multiplier on all payouts during free spins. Spin the reels to see if you have what it takes to be a barista in this coffee house and you could end up with a pocket full of green! The golden coffee coin is a scatter. Spin two or more anywhere on the board to multiply your total wins. Spin three or more to trigger up to 15 free spins.